I have been sick for nearly six weeks, there’s something wrong with my stomach. I’ve been to three different doctors, had seven tests done, each with different supervisors and doctors and nurses. I am nauseous, if I eat to much it won’t stay down, and my stomach and intestines hurt. I have lost 20lbs (and part of my brain is all “huzzah” but I’m so tired, it’s not a very enthusiastic “huzzah”). It’s like overnight my guts mutinied and I can’t get them back under my control. And, while my doctors have diligently tried to give me things to help, they’ve either not worked or had side-effects so bad that I’ve been unable to take them long enough to see if they worked. The thing about an upset stomach is that you can still work, you’ll be grouchy and very tired, but you’re awake. The thing about working when you’ve been knocked out by a drug is that you can’t. So, of course, when people find out you’re not feeling well they 1. have a cousin/brother/aunt who had the same thing and it turned out to be celiac/stomach acid/cancer and 2. you should try acupuncture/unproven diet/homeopathy, it really worked for my friend/loved one/family member. And when you’ve felt like crap for six weeks, you’re pretty much willing to try anything to feel better. Even I, skeptic extraordinaire (I guess) am tempted to do things I know are useless. I sit here and think, “Well, maybe the placebo effect will help even if nothing else does.” It’s nutty, I know it’s nutty, and yet I am so miserably sick and there seems to be no explanation or cure forthcoming, it’s hard to say no to something that might possibly work, even through magical thinking. 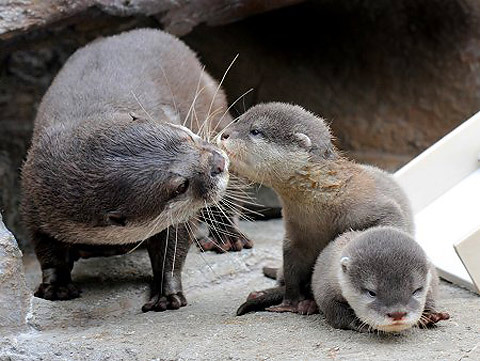 Here are otters, they make things ever so slightly better. Posted on October 3, 2011, in Otters, Real Life, skeptic and tagged acupuncture, alternative medicine, doctors, homeopathy, stomach issues, traditional medicine. Bookmark the permalink. 3 Comments. I’m sorry you are having such unpleasant symptoms and I hope you feel better soon. Ashley, I have migraine – frequent, severe intractable headaches; fortunately there is a drug that usually makes it stop hurting after a half hour or so. But year after year, the neurologist tries one or more medications in a futile (so far) effort to prevent them – but nothing works, and they all have side effects, some worse than others. I have decided to give it a rest. I don’t think any homeopathic or other alt med remedies will work – and it’s been such a long time that I have grown used to the idea that everyone has some sort of icky chronic condition, and mine is this blinding pain that comes and goes. At least I have the effective pain killer. I think years ago, migraine sufferers just dosed themselves with whatever addictive palliative was available – shrug. Just because the doctor hasn’t figured it out yet doesn’t mean there is no diagnosis or remedy – but I think I understand your frustration. Eventually I will let the neurologist try something new. it’s true, when you’re scared and desperate to be better, anything, almost anything, seems reasonable, no matter how remote. personally, I suggest smoking pot. it’s natural, quells nausea, stimulates appetite and, at the very least, you won’t care you’re sick, you’ll be meditatively relaxed. and prepared for whatever the doctors tell you next. Anecdotes, fear, and desperation are usually the points of entry for alternative ‘medicines’. In your case it seems like desperation, but I hope you find a real medicine that will help. As for Random Ntrygg’s pot suggestion, that isn’t my thing, but it couldn’t hurt.